This past Sunday, Tony Nese defeated Buddy Murphy and became the new Cruiserweight Champ. Good match. It was fought pretty evenly, though Gallagher seemed to be more in control than Carrillo. Carrillo hit some agile moves, but Gallagher always seemed to come back. That is, until the finish when Gulak decided to teach by example. After the match, Drew Gulak tries to beat a lesson into Humberto Carrillo. As Gulak reaches back to punch Carrillo, Gallagher grabs Gulak’s hand. Gallagher hits Gulak with a headbutt, sending Gulak out to the floor. Gulak looks back at the ring as he walks away. Buddy Murphy says he will prove that he is still the greatest cruiserweight of all time when he wins back his title tonight. 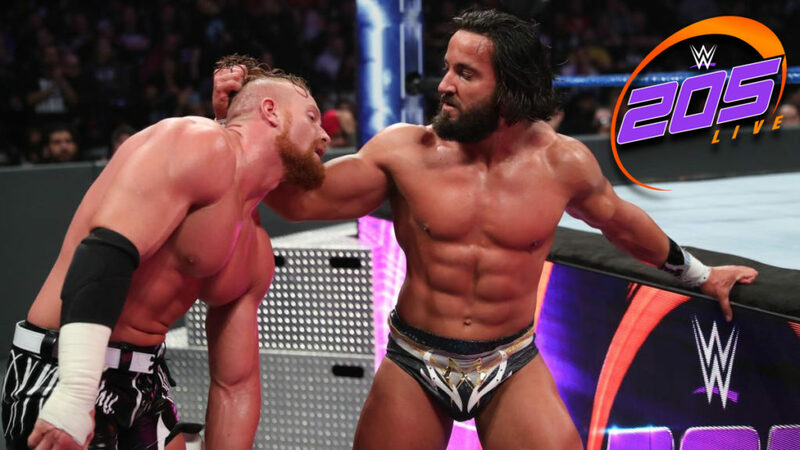 Tony Nese says he achieved his dream at Wrestlemania. He is proud to be a fighting champ, and he will stop the unstoppable once again tonight. Drake Maverick welcomes Oney Lorcan, but Cedric Alexander interrupts them. Alexander says he knows this meeting must be about his rematch with Lorcan. Maverick says ALexander will get that match next week. Lorcan tells Alexander that he came back to 205 Live to challenge Alexander because to be the man, you have to beat the man. Very good match. This fight built up to bigger and bugger moves towards the final few minutes. As the match went on, Murphy started to show the dominance he’s shown for the past year on 205 Live. Nese looked like he was in serious trouble, but Nese has found a new sense of determination lately. I really liked this match, though it does feel like Murphy might be moving on from 205 Live in the upcoming superstar shakeup. This was a good way to follow up Wrestlemania. Tonight’s title match was very good, and this episode touched on two stories/feuds that will be ongoing in the coming weeks. Nese’s believability began to straddle the line of unbelievability towards the end of the match, but regardless, this was a very good match for him.